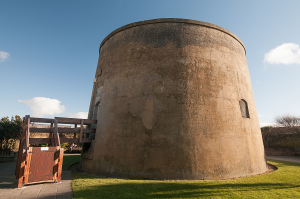 Martello Tower 73 – known locally as ‘The Wish Tower’ – is a Napoleonic era Martello tower sitting within a glacis (a military word for an artificial defensive slope) and surrounded by the walls of a moat. The whole of this site is to be found towards the western end of Eastbourne’s extensive promenade and is referred to as ‘The Wish Tower Slopes’ and, until recently, a cafe and sun lounge was located adjacent to the Martello Tower. The tower has been an iconic landmark on Eastbourne seafront ever since visitors started coming to the town and has featured on many photographs and postcards of the area. The cafe was popular with visitors and residents alike from its construction in 1960 until its demolition in 2012.